MyEtherWallet Review - How does the Most Popular Ether Wallet Work? If you own some cryptocurrency or you plan to buy it soon, then you will need a wallet to store it securely. Depending on what you need, you can choose from many wallets available in the market. MyEtherWallet, also known as MEW wallet, is one of the most popular Ethereum wallets. MEW wallet is one of the best options for storing, sending and receiving, both Ether and Ethereum related tokens. Therefore, I felt it was only right to give you a full, detailed MyEtherWallet review. This guide will cover all areas of MyEtherWallet. You will learn about the various features of this wallet and how they compare with the features of other wallets. I will cover, in detail, the MyEtherWallet supported coins. I will also provide a step-by-step guide to set up your own MyEtherWallet. By the end of this guide, you will be able to decide whether MyEtherWallet is the right wallet for you or not. You will also have a clear understanding of how to set up the MEW wallet and start using it. Before going into the detailed MyEtherWallet review, let’s try to understand some basics about this wallet. 1.1 What does My Ether Wallet do? 3 MyEtherWallet Review – Is MyEtherWallet Safe? 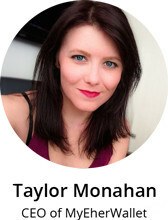 Before MEW, there weren’t many options to store and send or receive Ether, so Taylor Monahan created MyEtherWallet! This was in 2015, not very long after Ethereum itself was launched. MyEtherWallet has grown to become one of the most used wallets for Ether transactions. It has also evolved over time to include features which are required by the Ethereum blockchain. What does My Ether Wallet do? Let’s start theMyEtherWallet review with defining what it does. Simply put, MEW wallet is a website that lets you create an Ethereum wallet in seconds. You can use this wallet to store, send and receive Ether. Technically, the MEW wallet does not directly store your coins. MyEtherWallet gives you an address at which you can receive the coins from anyone else. This address is referred to as the public address of your wallet. Think of it as your bank account number, at which you can receive money from other people. What if you want to send the coins to someone from your MEW wallet? For that, you need a secret password called a private key. This private key is a randomly-generated, unique number. You should never give anyone your private key. Using this private key with your public address, you can send your coins and tokens to other addresses. Seems very important, doesn’t it? Well, it is! If you lose your private key, you lose all your coins. It is as simple as that. This is where MyEtherWallet becomes even more useful. MyEtherWallet will generate your private key, give it to you, and suggest ways in which you can keep it safe. Now that you know what MyEtherWallet does, let’s try to understand what makes it so popular. Setting up the MyEtherWallet can take less than a few minutes. Using MEW wallet, you can simply use your web browser to create your wallet. W will show you a step-by-step process of setting up a MEW wallet later in this guide. Once you have set up the wallet, making payments using the coins is very simple. Here’s the good news — it can also be easily used with other hardware wallets like TREZOR and Ledger Nano S.
It is completely free to use for every user. Isn’t that wonderful? These qualities of MyEtherWallet make it very popular, but is it secure enough to trust it with your coins? Let’s find out in the next section. MyEtherWallet Review – Is MyEtherWallet Safe? Even though you create the wallet through the MyEtherWallet website, the whole process is done locally on your computer. Data like private key and passwords are NOT stored on the MyEtherWallet servers. You can store the private key on your computer or on another hardware wallet like Ledger Nano S.
This is what makes MEW so secure. So this is a huge pro in this MyEtherWallet review. You have complete control over your cryptocurrency as the private key is not shared with anyone else, not even with MyEtherWallet. MetaMask is a browser plugin which allows you to make transactions on Ethereum using your regular websites. Simple enough? Head to the MetaMask website install their Google Chrome extension. From there, you set up an account. It’s as simple as one, two, three. Once you have set up the account in MetaMask, it becomes very easy to access your coins. You can go to MyEtherWallet.com, click the “MetaMask/Mist” option, and then click “Connect to MetaMask” button. This way, you can instantly unlock your wallet. Ledger Nano S and TREZOR, are very popular hardware wallets. They are USB devices that are used to securely store private keys offline — unlike web wallets, hardware wallets are not always connected to the internet. This makes them a very safe way to store your private key! MyEtherWallet can be integrated with both Ledger and TREZOR. You basically store the private key in the hardware wallet but use MyEtherWallet to send or receive coins. This way you get the user-friendliness of MyEtherWallet and at the same time keep your private key safe. When you create a wallet using MEW, you are given an option to download a KeyStore file in .json file format. This file contains the encrypted version of your private key. MyEtherWallet will ask for a password which will be used to generate KeyStore file and which will be required later to unlock your private key. This is safer than directly pasting your private key into MEW, however, I would always advise you to use a hardware wallet instead of a KeyStore file. When you create a wallet using MEW, you are given the private key. This is can be used to access your wallet, without the need of any password. It is not recommended to store your private key on your computer. Even if you want to access the wallet directly with the private key, you should print it on a piece of paper and store it in a secure location. MyEtherWallet provides many secure ways of accessing your wallet so another pros for this MyEtherWallet review. The best thing about MyEtherWallet is that it is not just secure, but it also very useful. Let’s have a look at some of the things you can do with MEW. MyEtherWallet is one of the simplest Ethereum wallets. What makes it so popular is that you can use it for much more than just storing Ether. Read on to find out what all you can do with MEW and what the MyEtherWallet supported coins are. We all know that MyEtherWallet can be used to store Ethereum, but what are these ERC20 tokens that we are talking about? On Ethereum’s blockchain, developers can build their own applications. ERC-20 tokens are like coins, but they belong to the applications built on Ethereum. For example, Civic is an identity app built on the Ethereum blockchain. Civic’s currency is called CVC — it is an ERC-20 token. Because these are built on Ethereum, you can store them in your MEW wallet. Not all Ethereum wallets accept ERC-20 tokens, but MEW does. And that’s another bonus added to this MyEtherWallet review. MyEtherWallet already has many ERC-20 tokens added to its list. However, if you do not find the token you are looking for then you can very easily add any custom token on the network. You just have to input the address of the token, token symbol and a decimal. To find these details, search for the “token address” of the token you are looking for. For example, if you want to add the Civic token to your MEW wallet, you would search Google for “Civic token address”. Usually, the token’s website will show you the details and also show you how to add it to your wallet if you need further help. And just like that you can add your custom token to the list of MyEtherWallet supported coins. Pretty great, right? Using MEW, you can access all of your ERC-20 tokens in one place! Must add another point ‘for’ to this MyEtherWallet review. Since most initial cryptocurrency offerings (ICOs) now use ERC-20 tokens, you can use MEW wallet to participate in ICOs. Firstly, you need to visit the website where the ICO is being launched. On that website you will be able to find the wallet address that you need to send your Ether to — this is how you buy their tokens. Once you know the wallet address of the ICO, it is extremely easy to send Ethereum from your MEW account to them. They will send you their tokens in return and the tokens will sit comfortably in your MEW. My ether wallet is one of the easiest ways to invest in ICOs that are related to the Ethereum blockchain. My ether wallet is simple, yet effective, and offers many features. Now that you know what you can use your MEW wallet for, it’s time to see how it compares to other types of wallets. This MyEtherWallet review is incomplete without comparing it with some of the other options available in the market. 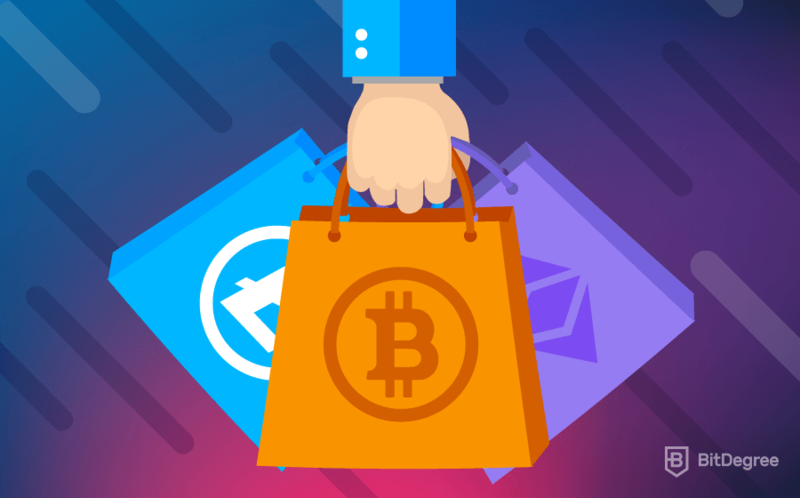 So, in this part of the guide, we will see how it compares to the other two most commonly used wallet types – online wallets and hardware wallets. As you can guess from the name, online wallets store your private key online (on the cloud). These wallets can be accessed from anywhere and from any device that has an internet connection. Because the wallet is online, there is a high risk of it being hacked. And once your private key gets stolen, your coins will be gone! Two of the most popular online wallets are: Coinbase and Blockchain.info. ✓ The best advantage that MEW offers is that it has much better security than most online wallets. ✓ More control because you can create your own wallet and have full control of your private key. Whereas most online wallets are controlled by third party companies. ✓ MEW supports ERC-20 tokens, while most other online wallets don’t. ✗ Online wallets often give you access to cryptocurrency exchanges, which is not possible for MEW wallet. Hardware wallets use devices (like a USB) to store your private key. You can keep the device wherever you want, just make sure it’s kept secure. You can connect a hardware wallet to the internet to make a transaction and then take them offline again. 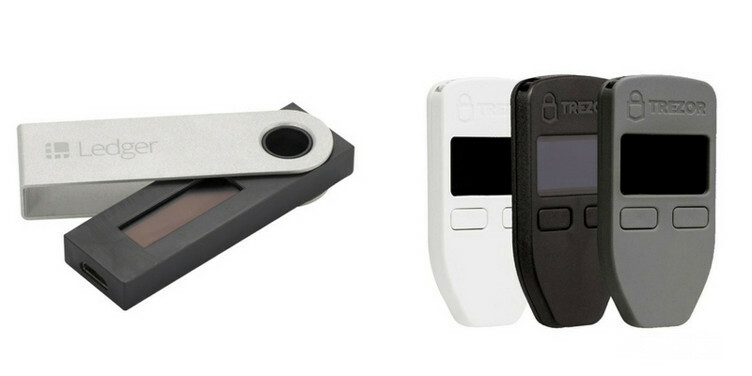 Two of the most popular hardware wallets are — Ledger Nano S and TREZOR. As we described earlier, MyEtherWallet works well with both of these hardware wallets. I recommend that you use MyEtherWallet along with these hardware wallets. However, if you are looking to use one without the other, then here are the pros and cons. ✓ My ether wallet is free to use while the cost of hardware wallets cost between $90-100. ✓ My Ether Wallet offers a great, easy-to-use interface and many features that are not available with hardware wallets. ✗ Unlike MEW wallet, hardware wallets support many cryptocurrencies such as Bitcoin, Ethereum and Litecoin etc. Now that we are coming towards the end of this guide, I would like to walk you through the step-by-step process for setting up your own My Ether Wallet. Let’s look at the steps you need to follow to set up your wallet on MyEtherWallet.com. Go to https://www.myetherwallet.com and make sure that the site you are on is real. If it is the real MyEtherWallet site then it will show “MYETHERWALLET LLC (US)” highlighted green in the website address bar. This is important to check as there have been many incidents where hackers have created similar looking websites to steal user’s private keys. 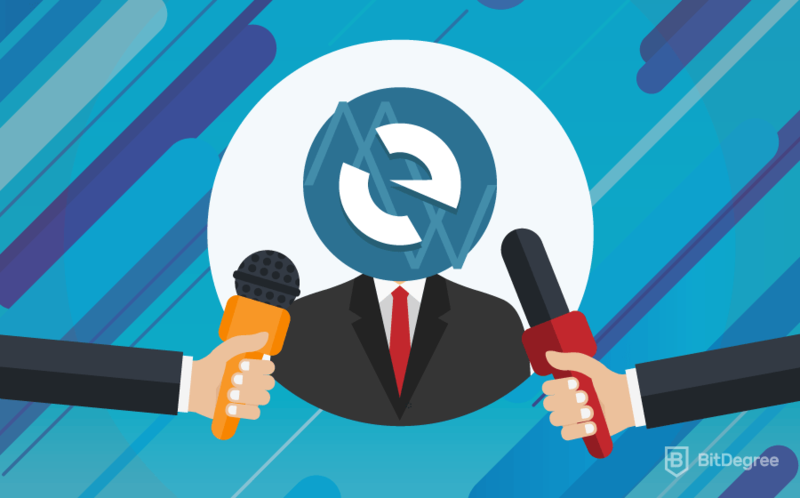 Make sure to bookmark the website once you find the real MyEtherwallet.com website. This will ensure that you don’t open the wrong My Ether Wallet site in the future. To do this, you must click the star in your website address bar. You will see the option to ‘Create New Wallet’ on the home page of MEW wallet. Or, you can click the menu option “New Wallet” to get to this page. Once you are on this page, all you need to do is enter a password that you can remember. Then simply click on the “Create New Wallet” button. Once you have clicked the “Create New Wallet” button, MyEtherWallet.com will generate a password protected private key — also called a “KeyStore” file in UTC/JSON format. You can use the KeyStore file to access your wallet, so it is extremely important to keep it safe. Store it in a location on your computer where you will remember. Once you have done that, you be given the private key to your new MEW on the next screen. This private key can be also be used to access your wallet. For this reason, you need to keep it extra safe. Remember, anyone with your private key can unlock your wallet and steal your coins. I recommend that you print your private key onto a piece of paper (shown below). This contains the details of your private key as well as a barcode which can be used to access your MEW wallet. After you have safely stored your private key, you can check your wallet’s public address by clicking on the button “Save Your Address’. As you can see from the image below, MyEtherWallet.com provides you with several ways to access your wallet. We have already described most of these options earlier on in the guide. In this example, we will access the wallet using the Keystore file. After selecting the option ‘Keystore / JSON File’ you will then be asked to “Select wallet file…”. When you click the ‘Select wallet file…’ button, a window will open that allows you to select the KeyStore file from the location on your computer where you saved it. Since KeyStore file is nothing but a password protected private key, you will be asked the same password that you used in Step 2 to unlock the KeyStore file. See Image below. After following all the steps above, you will be granted access to your wallet. And that’s how easy it is to set up your own My Ether Wallet. And there you have it, a full MyEtherWallet review. Now you can see why My Ether Wallet is one of the most popular Ethereum wallets available. It is super easy to use and lets you store Ethereum as well as ERC-20 tokens which is important for ICO investing. You should have a clear understanding of the pros and cons of MyEtherWallet when compared to other wallets. And now be able to decide which wallet you should use. If you decide to use My Ether Wallet, then you can quickly create your own MEW wallet using the step-by-step process in this guide. No matter which wallet you use, you must always keep your private key safe. If your private key gets stolen or lost, you risk losing all your crypto! So, is MyEtherWallet safe? This and other wallets are as safe as you want them to be. MEW offers good security, but the safety of your private key is your responsibility. With that being said, I think My Ether Wallet is one of the best Ethereum wallets available. But, what are your thoughts? Will you be creating your own MEW wallet? One of the best articles I have read till date. Easily comprehensible language with no use of heavy words, usage of right font size, font type & spacing. Explained it too well. 10/10. Keep writing such informative articles buddy. You are certainly the best.